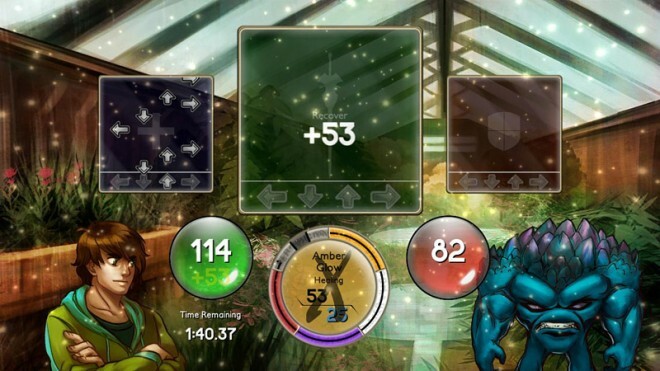 If you think that the fast-paced rhythm gameplay of Dance Dance Revolution wouldn’t mesh well with strategy role-playing games, Sequence hopes to prove you wrong. Sequence , released last Thursday for $5 on Steam, tasks players with battling vicious monsters while a musical score of smooth, clean electronic synth plays in the background. During combat, arrow symbols fall from the top of the screen and the goal is to press the corresponding keys to the beat of the music. By doing this, you carry out tasks in battle, everything from attacks to casting spells. This clever and skillful blend of genres is the creation of Jason Wishnov, a 25-year old computer and electrical engineer from the University of Florida. Sequence is his first game. Another game that seamlessly married RPG mechanics with an unorthodox gameplay mechanic was Puzzle Quest , which breathed new life into the shopworn match-three puzzle game genre. Players went on quests, upgraded their equipment and did battle with a variety of enemies, all by matching like-colored gems. “[ Puzzle Quest ] showed that completely disparate concepts could work well in unison,” said Wishnov, who counts himself as a big fan of the series. But Puzzle Quest alone didn’t suggest the type of game that Wishnov wanted to create. Another inspiration was Amplitude , an early music game developed by Guitar Hero creator Harmonix in which players shifted between a layered series of note streams that each represented a different element of the song. So too does Sequence have players switch on the fly between three different combat actions: defending, casting spells and restoring mana. Each action has its own stream of falling notes that need to be matched in order to perform them. But if you see an attack coming while you’re in the middle of casting a spell, you need to quickly switch over to the “defend” action instead. The concept of switching streams provided the hectic, twitch-based gameplay that Jason Wishnov was looking for. Wishnov turned to two of his favorite musicians, asking them via email to help work on his game. Ronald Jenkees, an electronic music maker whose YouTube videos have garnered tens of millions of views, composed the battle music while DJ and remixer Michael Wade Hamilton handled the rest of the score. The pair created a soundtrack comprised of both mellow, downbeat tunes and songs incorporating the hard, fast and infectiously danceable style of acid house. Wishnov says that Sequence , only available on Steam for the past few days, has already proven to be a success. When the game originally launched on the Xbox 360’s low-profile indie game marketplace in May, it sold less than 3,000 copies. But on Steam, Sequence exceeded that in its first seven hours. Wishnov isn’t done with Sequence , saying he’s planning on some free “bonus material” in the future.